Hee hee hee! What a DAY! Went to Leeds last night. The plan for today was to watch Dad takes his Glider flight that I had bought him for his 60th birthday and retirement, and then go to see the lady Fay had found in the hope of booking her to make my wedding dress. This morning the weather was terrible! And I mean, really really strange! There was sun, there was rain, there was hail, there was snow.... all in the space of about 2 hours! We thought they wouldn't let dad take his flight - wet weather affects how gliders fly and low cloud is not a good idea for a first time flyer. 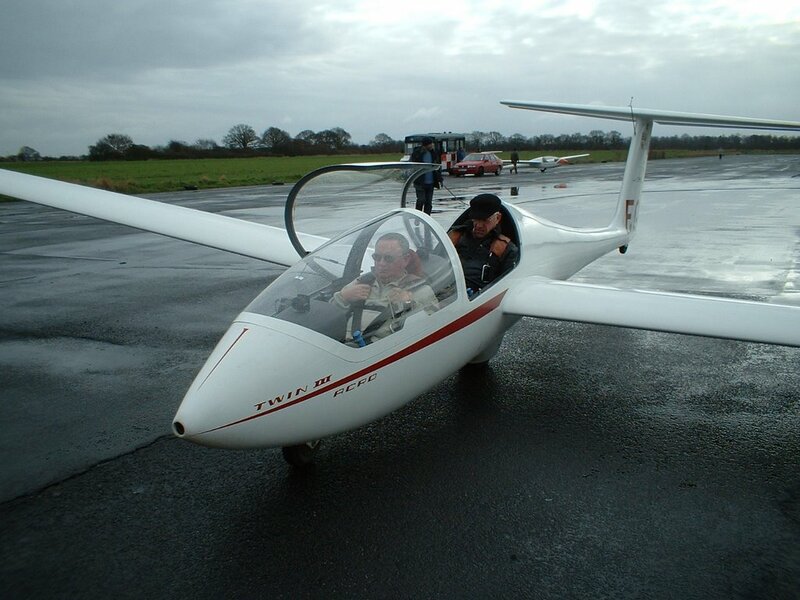 However, after a half hour wait it was desided that the weather was fit after all, and dad got ki tted out with his parachute, fitted into the glider and the basic explained to him. Once he was up in the air fir a while he would get to controle the glider!!! It was great to watch. He was taken up into the air and towed along for a while, dad sat in the front of the glider, and the official piolet / instuctor sat in the back. They did a circuit with the instuctor piloting, and then a circuit with dad piloting, and then the instructor landed htem. They were in the air four about 20 - 25 mins. By the time dad landed he was convinced that he wanted a membership to the club. As it happens, the gift voucher I bought him includes a months membership, and membership after that is still suprisingly afordable! I think I can safely say I have bought him a wonderful present there. See, on happy dad! After that we went for an Oh So Healthy Burger King Lunch (cheers dad!) and went back to Dad and Fays to get sorted out for my dress fitting trial. Juvy, the lady in charge of the dress shop, is lovely! She made me feel right at home straight away, and even managed to butter me up by "assuming" I was a size 12! I showed her the dresses I had tried at prontuptia on Monday, and Fay had already shown her the photograph I had found on the internet. By coincidence the sketch she and her apprentice had come up with already combined the best parts of the three dresses! Even though she had not seen the pronuptia dresses until that point. 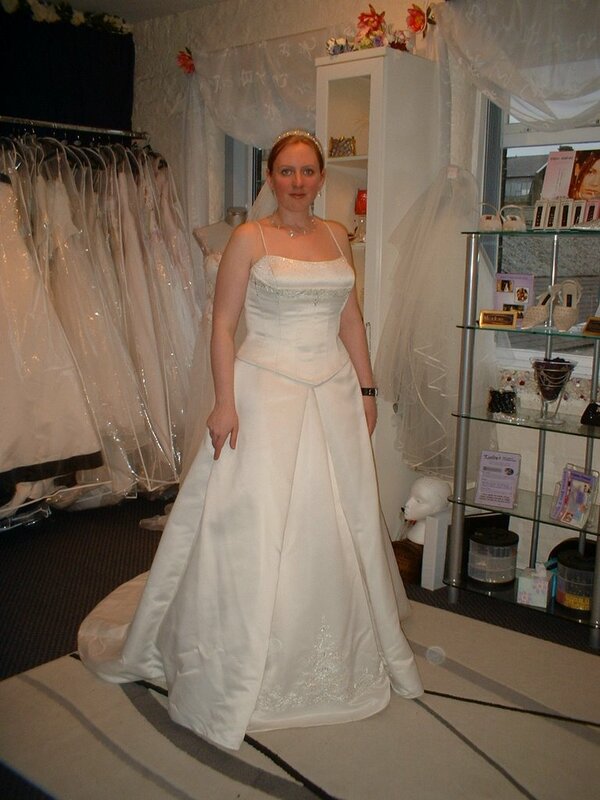 I tried on about 4 dresses again, the fourth being one which Juvy had picked out for me, one I had already seen and dismissed because, beautiful though it was, it was very much like the one in pronuptia that didn't look right on. Grudginly I tried it, and lo! It looked AMAZING! I mean, I still want to loose this last bit of weight, and there are a couple of alterations I would want to make to the decoration, colourwise, and it would need to be a little shorter as I am only a short girl! I shouldn't post a picture, but here goes. I think, with the alterations we have discussed, and with a stone less blubber round my middle, arms and face (and make up and my hair done) this will look great! It get's better too! As Fay and I were leaving, Juvy was telling us about the reloction she is planning, and how there are other things that need up dating.... like the WEB SITE! So we jumped in and pointed out that I make and maintain web sites, so she asked me to bring in some examples of my work so that I might make and maintain HER website, and if i do, there will be discussions about discounted wedding dresses!!!!!!!!!!!!!! In her words "You scratch my back, I'll scratch yours!" Is there ANYTHING about this wedding I can't get a discount on!!! Now there's a new plan. In order to get this dress agreed on and the design started on, we need to pay the deposit. But I am not happy about agreeing on a dress until I have gone through it all with my mum, as no matter how well I get on with Fay these days, Mum is still my mum, and her approval is final! I ran this past Fay and she said she had no problem spending an afternoon with me and mum next weekend - which is when we will have to get this sorted out - and I know mum has no problems with that as we have talking these things through long ago. 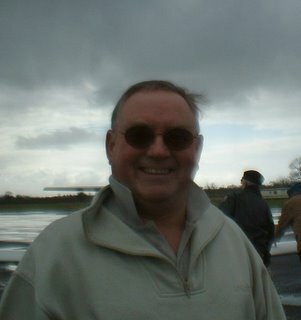 Dad, however, would be a stumbling block as HE has issues with the thought of Mum and Fay getting along (hee hee hee). Over dinner this evening before I came home me and Fay gently arrpoched the subject to Dad, who looked more terrified of the consept of his ex and his current spending time together than he did of flying hte glider! But finally he conseded that if it was what I wanted, then it was what I got and "we'll over have to get over things before the wedding anyway" HA! Like I said, he's the only one with an "issue" to "get over". As soon as I got home I called mum and ran the idea past her, and she is more than happy to come along to Leeds with me next weekend, and see the dress, and discuss with me, and with Fay, and with Juvy and her aprentice the final design of the dress. Fay already have the cheque from Dad to pay the deposit, and Juvy also assures me that she WILL be able to get the cloth Yorkie wants for his suit too! An all round win, I think!